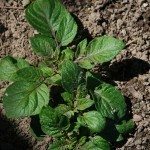 Getting rid of Colorado potato beetles naturally. I have some of these nasty little things on my potatoes. I am sprinkling ash from the woodstove on the plants. Is there something else I can do to extinguish them? You may need to control with a variety of methods.